Although some–like you, for example–are still waiting by the mailbox for their yarn, our Bang Out a Sweater knitalong of Mary Jane Mucklestone’s Stopover sweater was in full swing on Monday, its first official day. 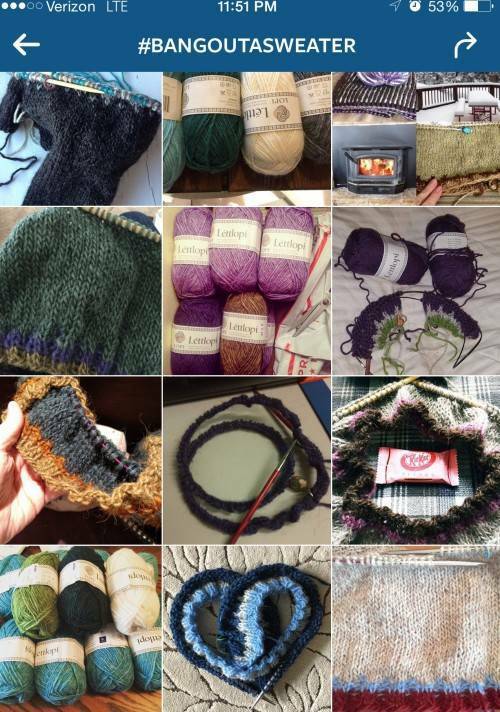 There are well over 500 comments in the Ravelry thread in the Mason-Dixon Knitters group, and over 250 images in the #BangOutASweater hashtag on Instagram. It’s the sort of thing that makes you fall in love with knitting again (even if you never fell out of love with knitting). The creative energy of knitters, their excitement about color, their fervor about getting things right, their humor (someone’s Stopover has a sock monkey color theme; others have taken our Bark Out a Sweater joke to heart, and are knitting tiny lopapeysas–complete with Stopover’s colorwork–for dogs. Whether you’re knitting along or not, get over there and have a wallow in the wonder of it all. At midnight last night, I was quite a bit further along than this photo, but only at the halfway point to the yoke. I’m not happy about this. 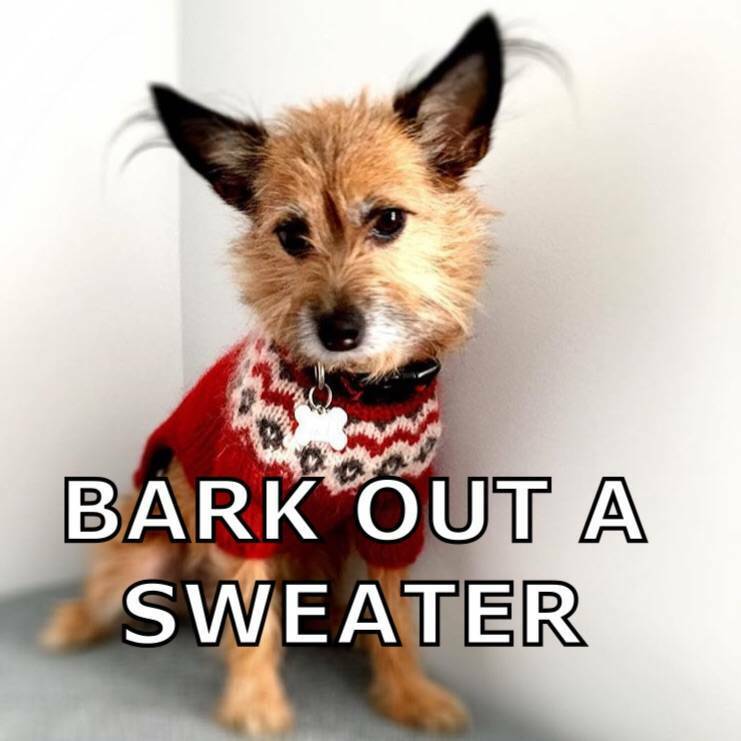 In winter, sweater delayed is sweater denied. Must do better. Thank goodness Stopover is moving along so quickly. Here’s where things stood after two hours of knitting. After another hour and a half, I made it to 5 inches from the armholes. Why am I telling you how long I’ve knitted? I’m keeping a running tab of how much time I’m spending on my Stopover, size small. Since so many people are knitting it, it would be fun to compare notes on how many hours the sweater took for different people knitting different sizes. Kind of a grand scientific experiment: how long does a “weekend sweater” really take? If that’s interesting to you, keep track, and report in later. Oh my! Your video! Anyway, I have the yarn in hand for the KAL, so maybe I will join in this week…..feeling like I should finish a project or two (!) first though – oh the guilt! Hopefully the yarn arrives tomorrow. Love the Instagram shot! I’m knitting the size XL and each round takes about 6 minutes. Yes, I timed it. This is the kind of documentation I totally love. I’m going to calculate SPM (stitches per minute) and SCPH (squares of chocolate per hour) while making my Stopover. SCPH. Hey, what is the Mason Dixon official chocolate? I remember an official cookie – Girl Scout Thin Mints – was voted in a wheelchair back. If there is an official chocolate, I’m hoping it will be available throughout the year…. Reykjavik: Red Cross Thrift Shop. There are several Icelandic sweaters for sale (all of which look gorgeous ) in children’s sizes. I saw the picture last night in Facebook, on the page of a closed group called Yarners. I was not able to share it. My yarn came yesterday. Hurray. Swatched last night and got gauge (after it was washed) which kind of scared me a little. I don’t trust it. Cast on this morning. Am already in love. Happy Groundhog Day! I am late to EVERYTHING. Headed to cafe to swatch now. For an entirely different sweater but one which I still hope to BANG OUT. I am starting again this morning after realizing my gauge was not correct. Take 2!!! Whew! Mail lady was late yesterday but did arrive around 3PM with my knitting needles!!! (rural area) Grabbed them and started. Was able to get to the point to start the decreases. Loving my color choices and off to a jolly good start. Checked out Instagram photos-who are the awesome overachievers with fair isle sleeves and nearly complete sweaters?? Must be the same people who are finished with Christmas 2016 shopping. Congrats on your talented efforts! That video of you & Ann never gets old! And I have no clue of the sing or people you’re parodying. It’s that good! I also thoroughly enjoyed your periscope video w Carrie. Why? Bec you were so giddy with excitement. And also bec you & Ann know how to make the mundane fascinating & funny. Happy knitting! That would be “song” or people…. I can’t knit like yawl but I do know basic English. Well, most of the time. Olive is adorable in her very own Stopover. My 4-legged child says the outfit he was born in (double layer terrier fur) is sufficient so I’ll work on a hat until my yarn arrives. When my arm got tired last night from knitting, I went to bed and started thinking about Icelandic sweaters and how I didn’t really know anything about them. The next thing I knew, I was reading, and then buying a book by Vedis Somebody’sdottir, and then looking up patterns in Ravelry….now an Icelandic tunic pattern is waiting in my queue. The Instagram pictures are so much fun. I am not participating AT THIS TIME but when I do finally knit this sweater I will be eternally grateful for the collective experience. RE: time per round, etc. This sounds like Data Collection. No doubt someone is warming up an Excel spreadsheet with all kinds of possible statistical analyses….a FitBit for knitters could be the next big thing! 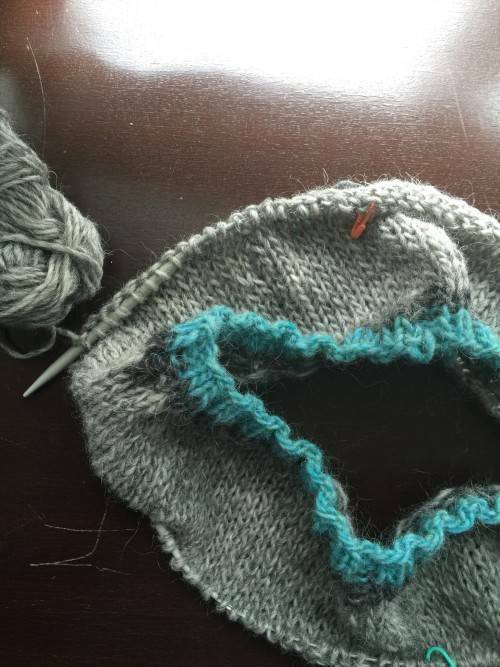 Keep track of your knitting electronically and download it to a program! I would be the last person to use it but some genius out there could surely make it work. I’m with you in spirit, pounding out a “Snow White” pullover by Ysolda Teague in Shepherds Wool. I hope to wear it to a wedding on Feb. 13, and also have an incentive to work quickly so I can wear it a few times before spring arrives in Tallahassee. Brilliant idea to keep track of the hours. Haven’t started my sweater yet, but I’m still having fun! Hey! That’s my coil of cast-on in the instagram collage! I feel so honored! (And called my mom, lol). 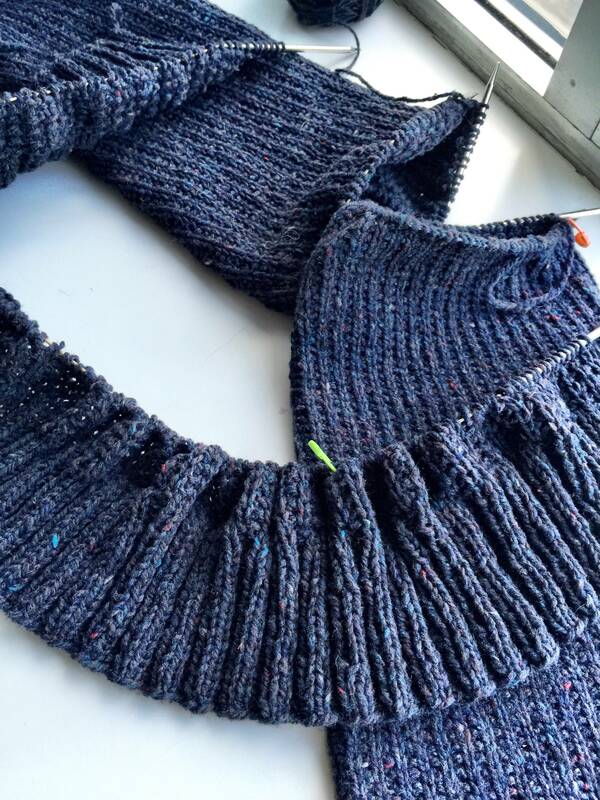 Some notes on knitting with plotolopi, a great favorite of mine. 1. Pulling the yarn gently from the center of the cake will result in less breakage. 3. If knitting with a single strand of plotolopi, I would use a double strand on the thumb side of longtail CO. Lopi, with its very long fiber length, as a great deal of integrity when knitted into a fabric, but the edges get a lot of “abuse.” Not suitable for this project, but I-cord edges are very durable. 4. Ribbings in lopi yarns tend to not hold their shape well as the wool has little recovery/elasticity. If your ribbing looks loose to you, go down a needle size. 5. I personally prefer to knit plotolopi on #5’s and #7’s but my Icelandic friend told me that she has knitted it on #10’s as this pattern is written for. 6. Plotolopi is especially delicate when wet. The above-mentioned friend told me to soak the garment for not more than 10 minutes; my new lopi book says no more than TWO minutes. 7. Putting hair conditioner (I don’t rinse the Eucalan remnants out first), fabric softener or vinegar into final rinse water will help to soften the lopi. It also becomes softer with wear. Wow, thanks for this Clip & Save, D Louise. A “What I call” Knit-A-Long!